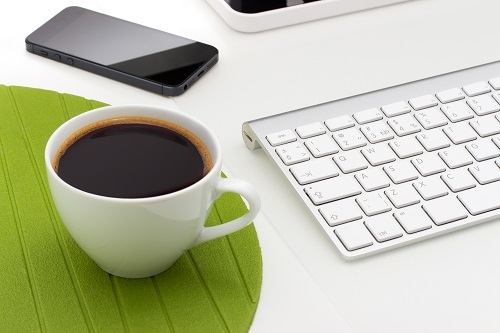 Healthy Workplace Tip #1: If you drink coffee, try to drink only one cup, and try to do this at a routine time each day. Coffee is a stimulant and thus increases your heartbeat, which can actually contribute to your stress! Also, many coffee drinkers don’t understand this, but their morning dosage puts their bodies on a roller coaster trajectory, up and down, until they bottom out in exhaustion. A few hours after consumption the artificial high dies down, leading many to reach for another coffee or sugary food, which again puts them in the mode of fluctuation in energy and alertness, leading to adrenal exhaustion (coffee stimulates the adrenal glands to make adrenaline). It’s safe to say that coffee isn’t a very good habit for creating sustainable energy and mind clarity throughout the day, so if you can drop it, do it. Healthy Workplace Tip #2: Stand up. It sounds crazy, but it’s true! Standing up every hour or so has been shown to produce many short and long-term health benefits. Sitting for many hours at a time constricts your body’s natural processes, weakens muscles, and can create muscle tension if you’re in a bad position. Standing up will revive you, get the blood circulating better again, and reduce your chances for long-latency diseases such as heart disease. This is also good for your back, where you can develop problems if you are sitting most of the time. Even a few minutes of standing every hour can make a huge difference! Healthy Workplace Tip #3: Choose the Healthy Foods. Oftentimes our diets are just set up on the rule of convenience–forgot to prepare, look what’s available, get caught by the smell of the french fries–and bam! You’re eating that cholesterol-rich food again! Your work lunch habits make a big difference to your life’s health, so make sure to be intentional and maximize opportunities to bring your own lunch (always have a fruit and try to bring veggies too! Baby carrots are fun). If you can’t, know what you will buy ahead of time that will help you reach your health goals. If you’re looking for more ways to improve wellness at your workplace, consider approaching your employer with a request for a corporate wellness program. Corporate wellness programs cut health costs for many companies because of how much they help employees improve their health. Wellworks For You offers many options.